BSUH NHS Trust has upgraded its ageing Video Collaboration technology across MDT rooms and meeting spaces within the Princess Royal Hospital and Royal Sussex County Hospital, replacing overcomplicated technology with simplified collaboration solutions, designed for today’s healthcare workforce needs. Treating over 750,000 patients ever year, the Brighton and Sussex University Hospital NHS Trust aims to be the provider of choice for local patients and the provider of specialist and tertiary services for the wider population of Sussex. To achieve it’s vision, the BSUH NHS Trust places quality at the heart of everything it does, to improve the patient experience, provide the best care and improve patient safety through QIPP – Quality, Innovation, Productivity and Prevention. BSUH NHS Trust recognises that supporting patient services with modern health informatics including the effective use of video, voice and data technologies, can greatly assist with the trust’s vision. After a strategic review of telecommunications solutions in place, BSUH NHS Trust recognised the current technology to be over-complicated, confusing and costly, and was not achieving the efficiency gains expected. Clinicians suggested that systems often wouldn’t work as expected and they found the technology complicated to use, resulting in low user adoption and therefore low return on investment. The human impact of this lack of efficiency was noted too – collaborative solutions were installed to speed up discussions and decision making between professionals from multiple clinical disciplines. For situations where time is of the essence, for example for cancer treatment plans, or where these specialists are in high demand, it is even more important that any solution performs effectively and efficiently. 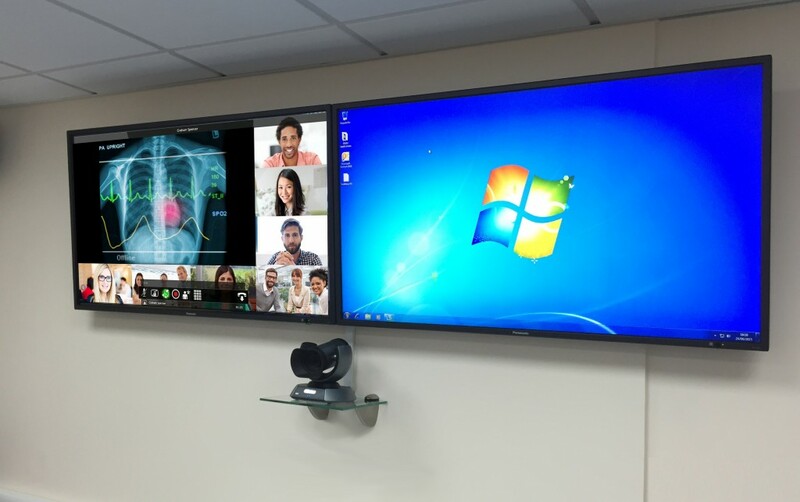 BSUH brought on-board UK Video Collaboration & Conferencing partner, VideoCentric, to consult, design, deploy and support a simplified and modernised collaboration solution for MDT rooms . The aim was to reduce the number of calls into IT, grow confidence and adoption, and cut down travel between sites, as well as improving the quality and integration of other platforms and technologies already in place, such as Microsoft Lync 2010 and 2013. Any technology implemented needed to be intuitive to use so that training would be minimal, and that external medical devices and equipment, such as PACS machines, could easily share its output with those both within the room and at remote sites. 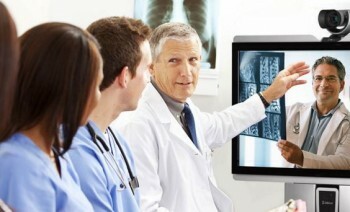 To ensure MDT rooms within the acute medical team, Cardiac services, Neurology Research and Radiology departments could be modernised, simplified and efficient, VideoCentric initially provided a pilot install within the Radiology department to enable cardiologists and clinicians, along with IT staff, to test and trial the new Collaboration solution. 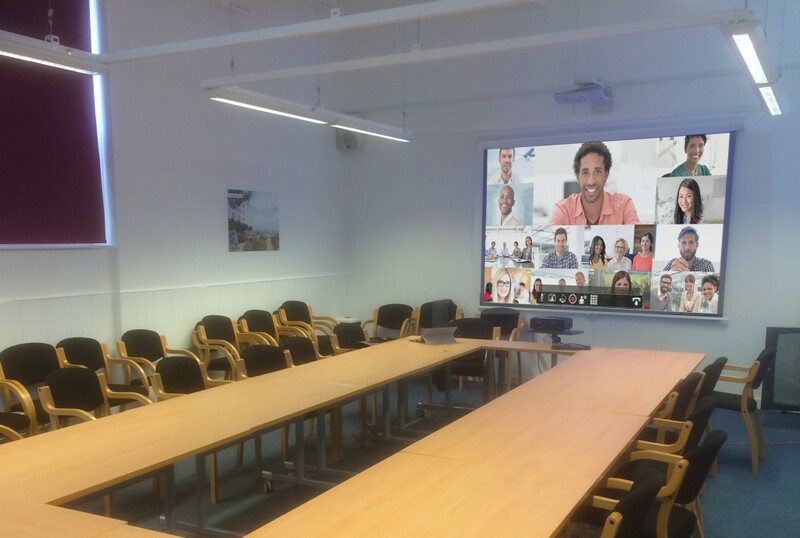 VideoCentric then installed Lifesize Icon endpoints within each of the meeting rooms, paired with high quality AV equipment so that PACs images could be shared and viewed clearly, both for local meetings and those involving remote consultants. 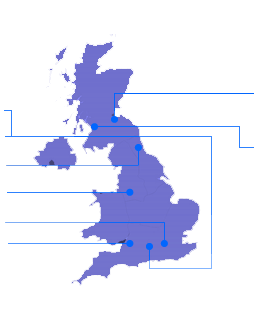 The solution provided access to multipoint conferencing and mobile applications via virtualised infrastructure situated within the BSUH own Data Centre at the Royal Sussex County hospital. By providing simple and secure access from any mobile device, remote consultants are able to join an MDT meeting wherever they are located, removing distance barriers and enabling clinical decisions to be made in much shorter timescales. To simplify the MDT rooms further, the complex touch panels were removed by programming a single switch that would turn on or off all of the video conferencing systems, screens, projectors and AV equipment in the room. All new equipment was hidden in a small, locked cabinet to prevent the removal of cables. The newly installed collaborative solutions demonstrate BSUH’s pioneering vision to improve the patient experience & provide the best care, whilst ensuring saving targets are being efficiently met. VideoCentric continue to work alongside BSUH IT department to ensure the desired outcomes are achieved and exceeded both now and into the future. VideoCentric continue it’s vision to develop long-term partnerships through knowledge and experience, extended service level agreements tailored to a hospital’s specific needs, dedicated healthcare account managers, and vendor influence enabling software patches & fixes to be pushed through based upon customer feedback. Due to the successful deployment of this Video Collaboration solution at BSUH NHS Trust, VideoCentric are rolling out similar solutions into a number of other NHS Trusts across Sussex and further afield.